Painted Daisy | Gurney's Seed & Nursery Co.
Every bit as easy to grow as meadow daisies—and much more colorful! Produces big, cheery flowers, 3 ft. tall. Prefers full sun. Bareroot. Soil RequirementsWell-drained humus enriched soil. PruningCut flower stalks to ground to force another flush of blooms. CommentsLong-Lasting! 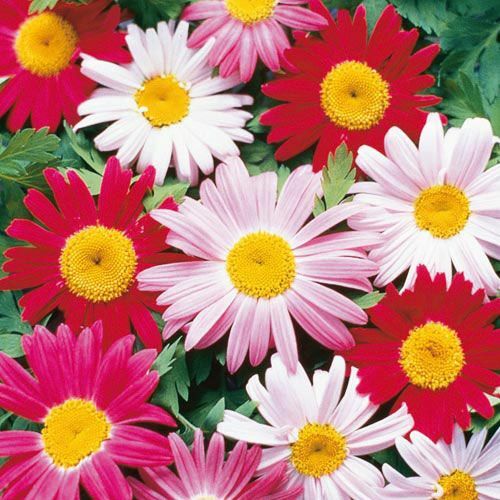 As easy to grow as meadow daisies, and much more colorful! Bold reds and pinks, our choice, bloom early to mid-Summer on 2 - 3 foot stems. Bareroot. DepthPlant crown(where the roots meet) 1 inch below the soil surface.